Following "Guitarra Makaka", the second solo album of Tó Trips released in 2015, the trip this time is jointly: Tó Trips (Dead Combo) and João Doce (Wraygunn). Two guys are on a beach in the northern of Portugal and flock to the far islands of Sumba! An imaginary world, which obliges us to a mindfulness: Sumba there is no time, there is no urgency. Everything is contemplated, admired, it is considered beautiful and unpolluted. João Doce met Tó Trips in 2004, in the Wraygunn tour. There grew a strong friendship. Esmoriz, the Esmoriz Beach, was the unifying point. First because João Doce made that city a place called home; then, To Trips finds there regularly a perfect place to regain strength. One day in the cafeteria of Environmental Buçaquinho Park - beautiful and bucolic place - the idea to do something together was born. The initial plan was simple: Tó on guitar, João Doce on percussion. 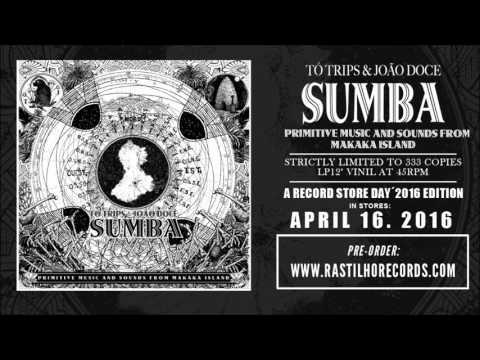 Sumba is born so this creative need of two talented musicians who, above all, are friends. It is a free exercise, spontaneous, experimental and tribalism. Such as Sumba Island, these 5 songs - recorded and mastered by Eduardo Vinhas in Golden Poney Studios - are conspicuous by their biodiversity.